At the 2012 North End CityFeast – Dining Out to Conquer Diabetes event to support the Joslin Diabetes Center’s High Hopes Fund, I realized that I am really good at eating for a cause. I’m also really good at eating for fun. And eating for two…or three when my blood sugar reaches the point of “ruh-roh”, and eating for no reason beyond the fact that eating is awesome. But every morsel of my meal at the premier North End restaurant Tresca tasted even better knowing that each bite was giving back to those fighting a disease desperately in need of a cure. After a quick reception at Antico Forno, where I did my best not to corner every waiter carrying around platters of steaming hot, ooey-gooey, crispity-crunchity arancini, and where Mayor Thomas Menino made a speech about the importance of the work the Joslin Diabetes Center’s High Hopes Fund is doing, I nestled into my seat at Tresca and held on tight for the five-course dinner to come. 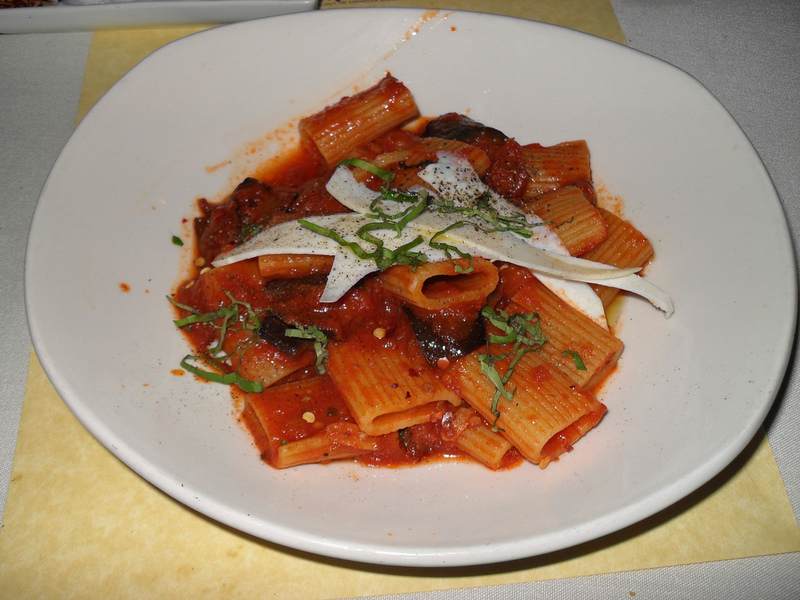 First off, an oldie but a goodie…yet with a Tresca twist! Our salad course was the Caesar con Tarfufi, a classic salad of romaine hearts and shaved parmesan cheese, elevated by a Caesar dressing spiked with aromatic and earthy white truffles. Simple to the untrained eye, but these eyes know something special when they see it. Instead of last, Tresca saved the best for second, in my stomach’s opinion. Keeping the truffle flavor flowing from the salad course, our next indulgence was the Crespelle al Forno, two crispy crepes studded with specks of chive, stuffed with truffled fresh ricotta, and topped with arugula and roasted wild mushrooms. The dish appeared as a perfectly wrapped present, and from the light-as-air ricotta, to the peppery bite of the arugula and the mushrooms and truffles that made me feel at one with the earth, I honestly could consider these crepes as a gift from the food gods…who apparently work in the kitchen at Tresca. When you think of Boston’s North End, you think Italian food. And when you think Italian food, you think pasta. And now when I think pasta, all I can think about is Tresca’s Rigatoni Norma. The Al dente rigatoni was dressed to the nines in a chunky San Marzano tomato and fresh basil sauce, only to be accessorized by smoky roasted eggplant and a spritz of shaved ricotta salata to make that lasting impression. The consistency of the sauce was ideal for me – thick, robust, not oily and able to stand up to multiple swipes of Tresca’s thyme-scented focaccia. My stomach was holding on for dear life, but I kept on trucking through the fourth course for the cause. Right? Right. 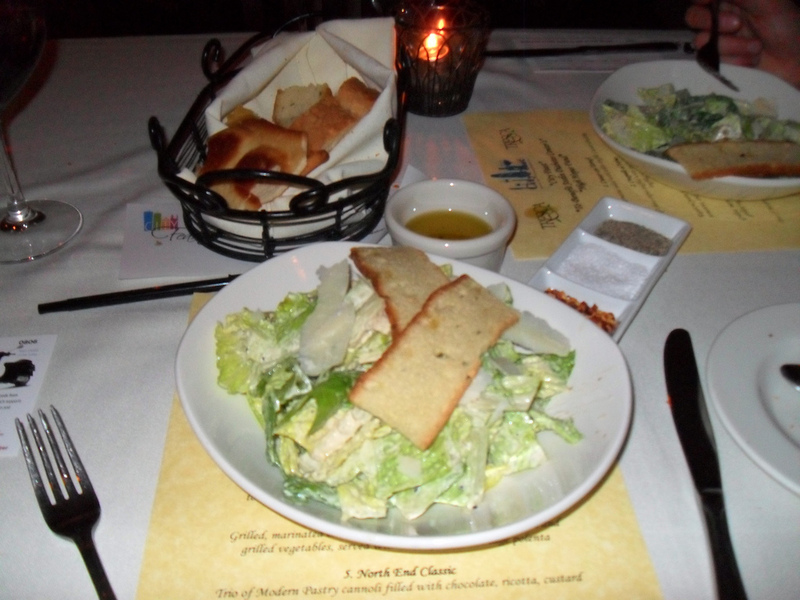 For the main meal, guests were served a mountainous portion of Tresca’s Pollo Romano. 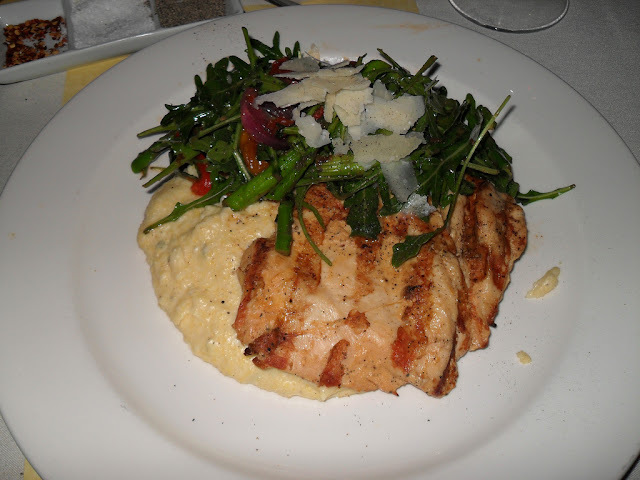 A butterflied breast of perfectly succulent grilled chicken sat atop a throne of sage-infused polenta, which was smooth and creamy, yet teeming with texture – just as a properly cooked polenta should. A lightly dressed arugula salad that was dotted with char-grilled tomatoes, perfectly snappable grilled asparagus and tangy caramelized onions rounded out the rest of the generous main course. Some people find ordering chicken at a restaurant “boring” or a “waste,” but Tresca’s Pollo Romano might be one of the most exciting and essential chicken dishes out there. Dessert was a true taste of the North End – a trio of cannoli from the famous Modern Pastry. 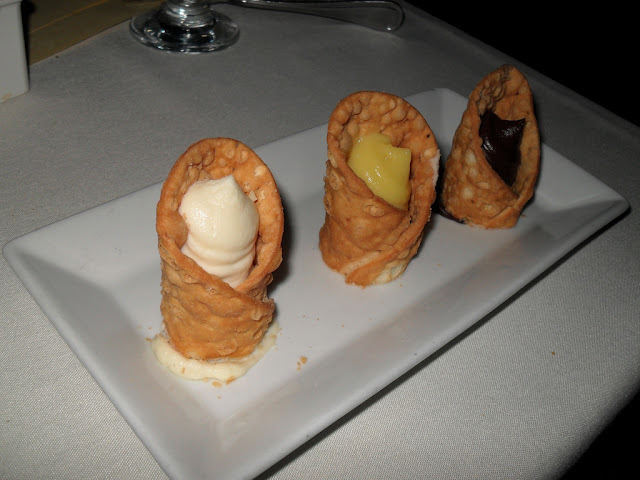 Standing upright like soldiers ready for battle, a seductive chocolate ganache, a subtle custard cream and a comforting traditional ricotta cannoli failed to survive against the inhuman appetite of this heavy duty eater. One, two, three, I knocked them down and secretly hoped my server was waiting in the trenches to lineup some more. Alas, a girl needs to learn willpower at some point. 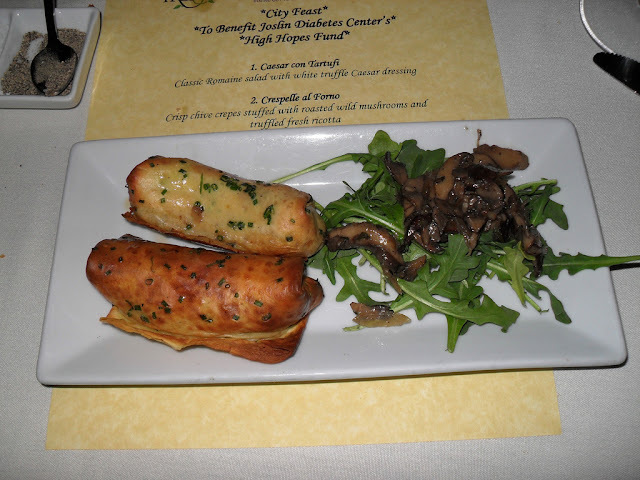 From start to finish, the 2012 North End CityFeast to support the Joslin Diabetes Center’s High Hopes Fund was a smashingly sumptuous success. As for Tresca, it’s always hard to narrow down where to dine in Boston’s North End, but now I know I have a go-to spot that can stand up to the pickiest of palates and the highest of expectations. I can’t speak for the diners who indulged at the other generous restaurants that participated – Antico Forno, Lucca, Terramia and Taranta – but I can almost bet that everyone part of the North End CityFeast is now a member of the “Clean Plate Club,” and also really good at eating for a cause.